G20 Meetings, Mario Draghi’s speech, German Ifo Business Climate, US New Home Sales, US Durable Goods Orders, US Unemployment Claims are the main highlights this week. Here is an outlook on the major events coming our way. Last week Scotland voted NO on independence from the UK in the historic referendum. The NO campaign’s victory was more decisive than the opinion polls had suggested, leaving the 307-year union in place. UK’s Prime Minister David Cameron acknowledged the Scots’ demand to have more power in the UK legislation and form a new constitutional settlement for the entire UK. Markets reacted with relief, bank shares climbed sharply after the market opened. Sterling initially gained in reaction to the result, rising 0.3 % higher to $1.6442, but later fell back against the dollar. Will the UK economy speed up growth in the coming months? G20 Meetings: Sat-Sun. Finance ministers from the G20 countries gathered in Australia to discuss measures to improve economic growth in the Eurozone by an additional two per cent by 2018. Measures to fight black money and tax avoidance were also discussed in this forum. Last week’s meeting resolutions will initiate the next meeting at Brisbane in November. Mario Draghi speaks: Monday, 13:00. ECB President Mario Draghi is scheduled to testify before the European Parliament’s Economic and Monetary Committee, in Brussels. Draghi may talk about the need for investments alongside Governmental aid. Volatility is expected. German Ifo Business Climate: Wednesday, 8:00. German business sentiment declined for a fourth straight month in August down to 106.3 from 108 in July, amid concerns about the Ukraine crisis and the impact of sanctions imposed by the Eurozone against Russia. The value of German shipments to Russia plunged 15.5% to 15.3 billion euros in the first six months of the year, with major declines in car and machinery shipments. Exports also fell due to smaller orders from Russia. Economists expected a higher reading of 107.1. The lukewarm growth in the Euro area also contributed to the decline in German business sentiment. Another drop to 105.9 is expected now. US New Home Sales: Wednesday, 14:00. Sales of new single-family homes declined for a second straight month in July to a seasonally adjusted annual rate of 412,000, from 422,000 posted in the previous month. Nevertheless, the housing market is on a growth trend. Larger stock of properties and tame prices will help boost demand in the coming months. New homes sales data is considered volatile, despite the decline new home sales were up 12.3 from July last year. Sales of new single-family homes is expected to rise to 432,000. US Core Durable Goods Orders: Thursday, 12:30. U.S. durable goods orders surged in July by a seasonally adjusted 22.6%, after a revised gain of 2.7% in the previous month while core orders declined unexpectedly by 0.7% following a 1.9% increase in June. The mixed data confused markets. Commercial aircraft orders hit the roof with a 318% increase, after Boeing signed a record number of contracts for new jetliners in July. Cars and trucks sales went up 10.2%. However, core durable goods orders, excluding volatile transportation items, missing forecasts for a 0.5% gain. Core durable goods orders rose by 3% in June. U.S. durable goods orders is expected to plunge 17.7% while Core orders are predicted to rise 0.7%. US Unemployment Claims: Thursday, 12:30. The number of Americans filing initial claims for unemployment benefits plunged unexpectedly last week to 280,000 from 316,000 in the prior week, indicating the lukewarm figures in August were a temporary relapse. Economists expected a small decline to 312,000. US economy has broad-based growth including the housing sector. The number of layoffs continue to fall. The four-week moving average declined by 4,750 to 299,500. The number of jobless claims is expected to reach 294,000 this week. As lackluster as the volatility and sentiment reaction was to last week’s FOMC decision, the event sustained the Dollar’s incredible run. Now on a 10-week bullish binge, this is the most enduring greenback run on record. Some will immediately consider this a ‘mature’ and ‘overbought’ market by virtue of its pace alone. Fundamentals, however, are not ready to revoke support for the bulls. As has been the case over the past weeks, key for the Dollar moving forward is the level of appetite for liquidity and the outlook for US interest rate expectations. And considering the scenarios, it may prove difficult to capsize the currency. In the primary fundamental veins that feed the dollar, interest rate expectations have offered the greatest blood flow to the bulls’ cause. While the Federal Reserve’s communication effort at this past week’s monetary policy meeting left much to be desired, there was enough tangible evidence of the march towards a first rate hike to rouse the bulls. While the second-to-last Taper (QE3 is expected to end at the next meeting on October 28 according to Chairwoman Janet Yellen) was a concrete step, it was the forecasts that really caught traders eyes. The outlook for employment, inflation and growth were little changed; but the interest rate projections increased substantially. In its consensus, the FOMC shows 14 of 17 members believe it is appropriate to start raising rates in 2015, versus 12 at the previous review. Furthermore, through the end of 2015, the Fed now expectes its Fed Funds rate to be at 1.38 percent. At the close of 2016, the benchmark is seen at 2.88 percent. That compares to forecasts of 1.13 and 2.50 respectively offered up in June – a full 25bp hike higher. That hawkishness is a boon to the Dollar as it sets it on a faster course to climbing the carry trade scale before most of its counterparts. In fact, this ‘dividend’ forecast keeps the Fed on pace to potentially realize its first hike before all the majors with the exception of the BoE, and its subsequent pace is arguably more intense than all counterparts. If there is a full consensus on the hawkish outlook, and investors have already positioned for such a future; then there could be a moderation of its subsequent climb without fresh updates to reinforce the theme or a new fundamental driver to take over. However, this well has not been fully tapped. While the currency and Treasury yields have climbed through the past months, there is still a dramatic disparity between the what the Fed is projecting and what the markets are accounting for. We can see that most directly in Fed Fund futures (a product used to hedge interst rate changes) which are pricing in a 0.78 percent rate by the close of next year (a 60bp discount to the FOMC forecast) and 1.38 percent by December of 2016 (a 150 bp difference). There is significant risk from the central bank’s perspective for the markets to be so far off the guidance they are trying offer. Last minute adjustments by the financial market to policy changes are typically much more violent. Yet, the central bank has contributed heavily to this confusion with mixed signals in its communications. Chairwoman Yellen made a considerable effort to avoid questions in her press conference about the signs that the market’s view didn’t match the Fed’s own rate outlook. We will see if FOMC members will try to rectify this in the week ahead. There are 10 scheduled speeches from 8 Fed members. The balance of their views – with special note of 3 ‘neutral’ 2016 voters (Powell, Dudley and Lockhart) – should be watched closely. The Euro tumbled to fresh lows versus the high-flying US Dollar on a week of bad news for Europe and much better developments out of the US. But why might the Euro/Dollar exchange rate be at risk of an important bounce? Almost all traditional fundamental signals point to further Euro weakness, and yet we see clear warning signs that such news and sentiment may be overdone. Everyone is bearish at major market bottoms and bullish at the tops, and that in itself is an important trigger which favors some sort of Euro bounce. Beyond that, however, we see technical reasons why the US Dollar rally may be overdone. High FX market volatility continued to drive the safe-haven US currency higher across the board as the combination of a US Federal Reserve Meeting, key European Central Bank results, and the highly-anticipated Scotland independence referendum fueled major moves. Yet the week ahead promises far less foreseeable event risk, and our forward-looking DailyFX 1-Week Volatility Index has pulled back sharply. The US Dollar’s strong correlation to volatility leaves it at risk on such a slowdown. It’s possible but unlikely that the Euro sees strong reactions to upcoming European Purchasing Managers Index (PMI) survey results, a German IFO Business Climate report, and a late-week GfK Consumer Confidence data release. Thus we’ll focus on how US Dollar traders react to calmer markets; we suspect that the EURUSD could bounce as sellers lose enthusiasm. Recent FXCM Execution Desk numbers show that total Euro trading volume slowed even as it tumbled to fresh lows. While momentum clearly favors further losses, the slowdown acts as clear warning that markets may soon capitulate. And thus we’re left with somewhat of a dilemma: on the one hand we believe that the Euro will remain in a downtrend, but too many signs warn of a near-term price and sentiment extreme. We advise caution on fresh EURUSD-short positions in the days ahead. The markets navigated through a treacherous succession of high-profile event risk over the past two weeks, leaving investors with much to digest. Investors will have just such an opportunity in the week ahead as a lull in news-flow allows for a period of reflection. This process may pave the way for a recovery in the Japanese Yen after the currency slumped to a six-year low against the US Dollar. The fragility of market-wide risk appetite is the key consideration. 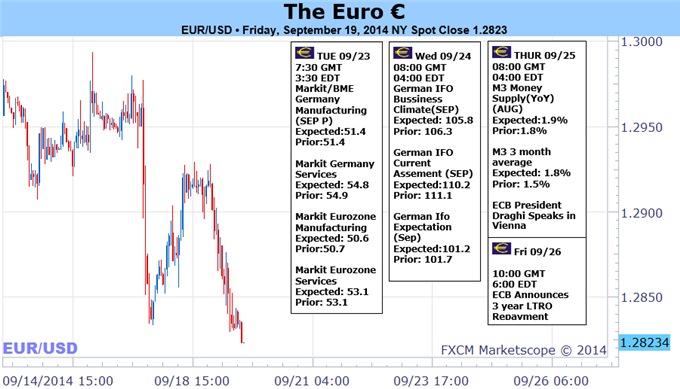 September began with an underwhelming easing effort from the European Central Bank (ECB). The markets were holding out for the launch “classic” QE – the purchase of government bonds with printed money – and didn’t get it. Confidence in another key component of the ECB’s stimulus package was shaken last week as the first TLTRO operation saw uptake of just €82 billion, far less than the expected €150 billion result. In the meantime, the Federal Reserve seemed to move closer to the hawkish side of the policy spectrum. An updated set of policymakers’ interest rate projections suggested Janet Yellen and company now expect borrowing costs to be a full 25bps higher in 2015 than they thought in June. The markets have taken notice: traders are now pricing in 60bps in US policy tightening over the coming 12 months, the most in the G10 FX space. This seems to bode ill for sentiment, which has managed to remain as resilient as it has been largely on the back of generous Fed accommodation over recent years. With the US central bank ever-closer to withdrawing its support and the ECB effort to replace it looking increasingly inadequate as a replacement, the threat of on-coming risk aversion appears to be growing. China presents one mitigating factor. Risk appetite swelled after the PBOC unveiled a new SLF facility injecting CNY500bn into its banking sector considering the move amounted to the approximate equivalent of a 50bps RRR decrease. Optimism may prove fleeting however considering the liquidity provision has a defined 3-month shelf life however, whereas an outright RRR rate cut would amount to an open-ended loosening of policy. That means investors may not find lasting comfort in Beijing’s efforts. Given the time to consider such macro-level forces, the markets may well conclude that the sum total of support offered by central banks outside of the US will not be able to replace the Fed at a foundation for sentiment trends. This points to a forthcoming selloff across the range of risky assets, opening the door for an unwinding of Yen-funded carry trades that sends the Japanese unit swiftly higher. The GBP/USD fell back from a fresh weekly high of 1.6523 even as Scotland voted to stay within the U.K., but fresh commentary coming out of the Federal Reserve may spur a further advance in the exchange rate should the group of central bank doves talk down interest rate expectations. A further expansion in U.K. home loans may encourage an improved outlook for growth, but market participants may ultimately turn a blind eye to the minor data prints coming out of the U.K. as the Federal Open Market Committee (FOMC) is widely expected to halt its quantitative easing (QE) program at the October 29 meeting. The key speeches by Fed voting-members William Dudley, Narayana Kocherlakota Jerome Powell and Loretta Mester may play a greater role in driving the GBP/USD next week amid growing speculation of seeing a rate hike sooner rather than later. Indeed, a greater emphasis to retain the zero-interest rate policy (ZIRP) for an extended period of time may undermine the bullish sentiment surrounding the greenback as Credit Suisse Overnight Index Swaps show a jump in interest rate expectations, with bets of seeing at least 50bp worth of rate hikes in the next 12-months. As a result, a wave of dovish remarks from Fed officials may generate a more meaningful rebound in the GBP/USD as the Bank of England (BoE) sticks to its current course for normalizing monetary policy. Despite the failure to hold above the 1.6500 handle, the recent series of higher-lows in the GBP/USD certainly paints a constructive outlook for the British Pound, and we may see the pound-dollar break out of the downward trending channel carried over from back in July should the group of Fed officials remain reluctant to move away from the highly accommodative policy stance. 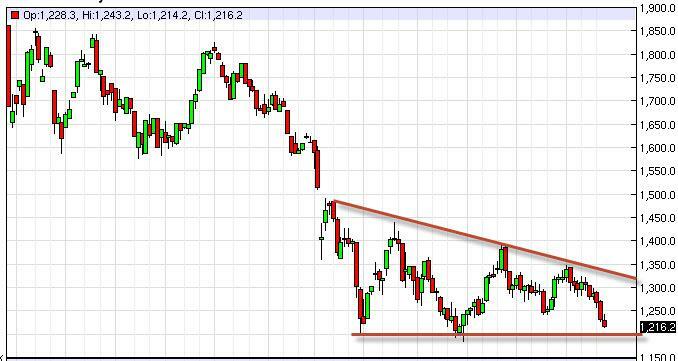 Gold Near Bottom of Range or About to Break Down? Gold prices are softer this week with the precious metal off by 1.13% to trade at $1215 ahead of the New York close on Friday. The decline marks the third consecutive weekly loss for bullion with persistent strength in the greenback keeping pressure on commodities based in US dollars. The losses were especially severe in the precious metals with platinum down 2.47%, palladium down 3.12% and silver down more than 4% on the week. The FOMC’s September rate decision was central focus this week and fueled a surge in volatility as the Central Bank retained its pledge to keep its highly accommodative stance for an extended period of time. Even though the Fed’s updated forecasts showed a narrowing corridor from the June projection, interest rate expectations jumped as Richard Fisher joined Charles Plosser to vote against the dovish tone surrounding the forward-guidance for monetary policy. With that said, the final 2Q GDP report is expected to show another upward revision to reflect an annualized 4.6% rate of growth, and the data may further boost interest rate expectations as the growing rift within the committee suggests that the central bank may be preparing to shift gears at the October 29. From a technical standpoint, gold broke below support at $1229 this week and our broader outlook remains weighted to the downside while below $1243. Note that a death cross has been identified with the 50-day moving average breaking below the 100 for the first time since late May. 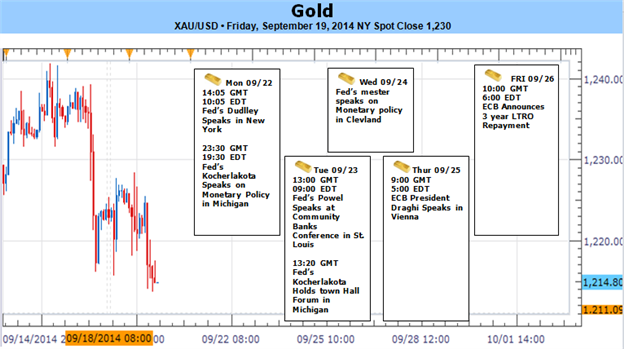 In that instance gold saw a near 4% decline before recovering in early June. Look for key support at $1203/06, a region defined by the December 31st close (day the yearly low was made) and the 88.6% retracement of the advance into this year’s high. A break below this level keeps our bias in play eyeing subsequent support targets at the 100% Fibonacci extension off the 2014 high at $1193 & the 2014 low at $1178. The gold markets initially tried to rally during the course of the week, but as you can see the $1240 level was a bit too resistive. Ultimately, we ended up forming a shooting star, and it appears that we are in fact going to head down towards the $1200 level. That level should be massively supportive, and as a result we feel that the market will test that area. If we can get below there on a daily close, we become extraordinarily bearish of the gold markets, as we should then head down to the 1000 level. On the other hand, if we see some type of supportive candle on the weekly chart, this would be an excellent area to start going long and aiming for $1350 or so. The EUR/USD pair initially tried to rally during the course of the week, but found the 1.30 level to be far too resistive. With that being the case, the market continued to show weakness, and we broke down to the 1.2835 region. It’s just below there that the 1.28 handle shows significant support, and we believe that a bounce from that area could happen. However, if we get at least a daily close below that handle, we think that the market will then fall to the 1.25 level as Euro weakness continues. The dollar rallied to fresh six year highs against the yen on Friday and hit a new 14-month peak against the euro as expectations for an early hike in U.S. interest rates continued to underpin investor demand for the greenback. USD/JPY was last up 0.34% to 109.06 after rising as high as 109.46 earlier in the day, the most since August 2008. For the week, the pair added 1.61%. 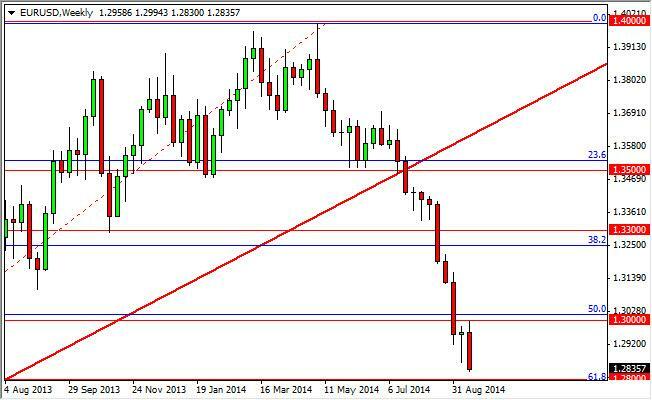 EUR/USD was down 0.71% to 1.2830 in late trade, the lowest level since July 2013. The US Dollar Index, which tracks the performance of the greenback versus a basket of six other major currencies, ended Friday’s session up 0.63% to 84.93, the highest level since July 2013, capping its tenth consecutive week of gains. The dollar has rallied in the past two months as economic data indicated that the U.S. recovery is progressing strongly, while growth in Japan and the euro zone appears to be faltering. On Wednesday the Federal Reserve offered fresh guidance on its plans to raise interest rates, underlining the diverging policy stance between it and central banks in Japan and Europe, which look likely to continue with looser monetary policy. The Fed statement reiterated that it expects rates to remain on hold for a "considerable time", after its bond purchasing program ends, but it outlined in more detail how it will start to raise short term interest rates when the time comes. The Fed also cut its monthly asset purchase program by another $10 billion, keeping the program on track to finish next month. The dollar was also higher against the pound, with GBP/USD down 0.68% to 1.6284 in late trade. The pair hit a two week high of 1.6523 earlier on Friday after voters in Scotland’s independence referendum elected to remain inside the United Kingdom. The pound fell to 10 month lows against the dollar earlier this month as uncertainty over the outcome of the referendum rattled financial markets, before recovering in the run-up to Thursday’s vote. The pound also trimmed gains against the euro, with EUR/GBP at 0.7878 in late trade, off the two year lows of 0.7809 struck earlier in the session. Elsewhere, the Australian dollar fell to a fresh six month trough on Friday, with AUD/USD down 0.66% to 0.8928, while NZD/USD was down 0.39% to 0.8119, not far from Thursday’s six month lows of 0.8076. In the week ahead, investors will be awaiting Tuesday’s data on euro zone private sector activity, amid concerns that the recovery in the region is losing momentum. Preliminary data on manufacturing activity in China will also be closely watched. The week will also bring a fresh look at the U.S. housing sector, with reports on both new and existing home sales, as well as Thursday’s data on durable goods orders and initial jobless claims. New Zealand is to release private sector data on consumer sentiment. European Central Bank President Mario Draghi is to appear before the European Parliament's Economic and Monetary Committee, in Brussels. The U.S. is to release private sector data on existing home sales. China is to release the preliminary reading of its HSBC manufacturing index. The euro zone is to publish preliminary data on private sector activity, while Germany and France are to also to publish data on private sector growth. The U.K. is to release private sector data on mortgage approvals, as well as a report on public sector borrowing. Canada is to release data on retail sales, the government measure of consumer spending, which accounts for the majority of overall economic activity. New Zealand is to release data on the trade balance, the difference in value between imports and exports. The Reserve Bank of Australia is to publish its financial stability review. The Ifo Institute is to release its report on German business climate. The U.S. is to publish data on new home sales. The ECB is to publish data on M3 money supply and private loans. Japan is to release data on consumer price inflation, which accounts for the majority of overall inflation. The Gfk think tank is to release a report on German consumer climate. The U.S. is to release revised data on gross domestic product, the broadest indicator of economic activity and the leading measure of the economy’s health. The U.S. is also to release revised data on consumer sentiment. The dollar rose to fresh six-year peaks against the weaker yen on Friday as expectations that the Federal Reserve will raise U.S. interest rates more quickly than expected continued to fuel investor demand for the dollar. The dollar has rallied in the past two months as economic data indicated that the U.S. recovery is progressing strongly, while growth in Japan appears to be faltering. On Wednesday the Federal Reserve offered fresh guidance on its plans to raise interest rates, underlining the diverging policy stance between it and the Bank of Japan, which looks likely to stick to a looser policy stance. The yen remained under heavy selling pressure amid expectations that the faltering recovery in Japan will prompt the BoJ to implement additional stimulus measures to shore up growth. Earlier this month BoJ Governor Haruhiko Kuroda said the bank would be prepared to immediately loosen monetary policy or implement other measures if its 2% inflation target becomes difficult to meet. Elsewhere, the yen was higher against the euro late Friday, with EUR/JPY down 0.37% to 139.95, off the four month highs of 141.20 struck earlier in the session. The week ahead will bring a fresh look at the U.S. housing sector, with reports on both new and existing home sales, as well as Thursday’s data on durable goods orders and initial jobless claims. Friday’s report on Japanese consumer prices will also be closely watched. The U.S. is to round up the week with revised data on gross domestic product, the broadest indicator of economic activity and the leading measure of the economy’s health. The U.S. is also to release revised data on consumer sentiment.